The Extron IN1804 is a compact four input scaler that supports signal resolutions up to 4K/60 at 4:4:4. It incorporates Extron-patented Vector 4K scaling technology specifically engineered for critical 4K signal processing applications. 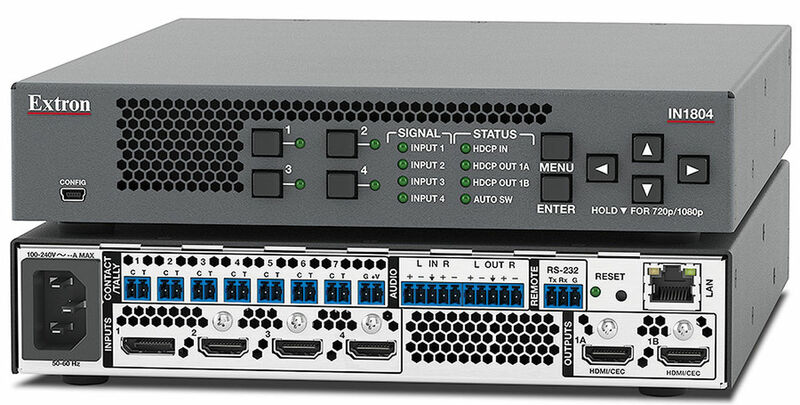 It features DisplayPort and HDMI inputs with available models that provide Extron DTP2 extension of video, audio, and control signals up to 330 feet (100 meters) over a shielded CATx cable. The IN1804 delivers the convenience of fast and reliable automatic switching, along with advanced capabilities such as audio embedding/de-embedding, seamless transition effects, and logo keying. Designed for professional AV integration, the IN1804 can be controlled and configured using Ethernet, RS-232, USB, and contact closure with tally outputs. The IN1804 incorporates the Extron Vector 4K scaling technology, developed in‑house and engineered to deliver best-in-class image upscaling and downscaling. The Vector 4K engine embodies a new set of image processing algorithms that deliver uncompromising scaling performance with 30‑bit precision processing. This enables sharp, accurate scaling of standard definition and high definition signals up to 4K, as well as downscaling of 4K source signals for lower resolution displays without losing critical image detail. For professional-quality transitions between sources, the IN1804 offers a range of switching effects. These include a freeze/fade transition that fades out a final frozen frame of the previous input source as the newly selected source fades in, a cut through black transition, and a fade through black transition. In addition, the IN1804 provides the capability to insert a custom graphic image, such as a company logo, onto the video outputs. Selectable FILL and FOLLOW modes are available to set the desired video aspect ratio. FILL mode provides full screen output, while FOLLOW mode preserves the original aspect ratio of the input signal. The IN1804 DI includes one DTP2 twisted pair input, while the IN1804 DO has one DTP2 output. The IN1804 DI can receive signals from remote DTP and DTP2 transmitters at a conference table, lectern, or wall. The IN1804 DO can transmit to a DTP or DTP2 receiver behind a flat-panel display on a wall, above a ceiling-mounted projector, or any other remote location. DTP transmitters and receivers are available in compact, low-profile enclosures, plus decorator-style wallplate and floorbox versions to suit the installation requirements of a specific application. DTP2 connections include additional convenient, integrator-friendly features designed to help simplify installation. Bidirectional RS-232 and IR signals can be inserted from a control system and transmitted over the single shielded CATx cable together with the video and audio, enabling control of a source or display. Additionally, the IN1804 DI and IN1804 DO can send power to select DTP and DTP2 endpoints over the same shielded CATx cable, streamlining system design and installation. The DTP2 output on IN1804 DO can be configured for compatibility with HDBaseT-enabled displays to send digital video and embedded audio, plus bidirectional RS‑232 and IR signals up to 330 feet (100 meters) over a shielded CATx cable. The IN1804 features front panel controls and on-screen menus for quick access to system settings. It also features automatic switching between inputs to streamline system operation when the unit is installed in locations such as a lectern or under a conference table. Remote configuration and control are available via Ethernet, USB and RS‑232, plus contact closure with tally output for input switching and muting. The IN1804 can be configured using Extron's PCS software with a user‑friendly GUI that is very easy to navigate. This software application allows for expedited setup and commissioning, real-time operation and monitoring, plus the ability to configure multiple Extron products units in the same session. Integrates DisplayPort, HDMI, and audio sources into presentation systems - IN1804 models provide centralized switching for a wide range of AV sources. DisplayPort, HDMI, and optional DTP2 inputs - IN1804 and IN1804 DO models feature one DisplayPort and three HDMI inputs. The IN1804 DI features two HDMI, one DisplayPort, and one DTP2 input. HDMI and optional DTP2 outputs - IN1804 and IN1804 DI models feature dual mirrored HDMI outputs. The IN1804 DO features one DTP2 output and one mirrored HDMI output. Selectable seamless switching transitions - Seamless freeze/fade, cut through black, and fade through black transition effects are available. Stereo audio de-embedding - Embedded HDMI two-channel PCM audio can be extracted to the Analogue outputs, or multi-channel bitstream formats can be passed to the DTP2 or HDMI output. Available integrated DTP2 extension supports transmission of video. audio, and control up to 330 feet (100 meters) over a shielded CATx cable - IN1804 DI features one DTP2 input and IN1804 DO features one DTP2 output. Compatible with CATx shielded twisted pair cable - IN1804 DI and IN1804 DO support a maximum transmission distance of 330 feet (100 meters) for all compatible resolutions when used with CATx shielded twisted pair cable. Shielded twisted pair cabling with solid centre conductor sizes of 24 AWG or better is recommended for optimal performance. Remote powering of DTP transmitter or receiver - IN1804 DI and IN1804 DO can provide power to a DTP or DTP2 endpoint over the twisted pair connection, eliminating the need for a separate power supply at the remote unit. Accepts additional Analogue stereo audio signals - IN1804 DI and IN1804 DO support stereo Analogue audio signals for simultaneous transmission over the same shielded twisted pair cable. Compatible with all DTP‑enabled products, plus XTP CrossPoint matrix switchers - Enables mixing and matching with desktop and wallplate endpoints, as well as other DTP and DTP2‑enabled products to meet application requirements. IN1804 DI and IN1804 DO can be integrated with XTP and XTP II CrossPoint matrix switchers to provide connectivity between presentation spaces and a larger, facility-wide system. DTP2 output is compatible with HDBaseT-enabled devices - The IN1804 DO can be configured to send video and embedded audio, plus bidirectional RS‑232 and IR signals to an HDBaseT-enabled display. User-selectable HDCP authorization for DTP2 and HDMI inputs - Allows inputs 2 through 4 to appear HDCP compliant or non-HDCP compliant to the connected source, which is beneficial if the source automatically encrypts all content when connected to an HDCP-compliant device. Protected material is not passed in non-HDCP mode. Supports custom EDID and output resolutions - User-defined scaling output resolutions can be supported by uploading custom EDID files, or capturing EDID from a display or other destination device. HDCP Visual Confirmation provides a green signal when encrypted content is sent to a non-compliant display - A full-screen green signal is sent when HDCP-encrypted content is transmitted to a non‑HDCP compliant display, providing immediate visual confirmation that protected content cannot be viewed on the display. Internal video test patterns and pink noise generator for calibration and setup - IN1804 models offer several video test patterns and audio pink noise to facilitate proper system setup and calibration of display devices. Audio file playback - Up to 16 pre-recorded messages may be stored and played back over the program audio output. Output volume control - Provides master volume control for the Analogue line level output, two-channel PCM HDMI audio, as well as DTP Analogue audio for the IN1804 DO model. Audio input gain and attenuation - Gain or attenuation can be adjusted for the Analogue audio input to eliminate noticeable differences when switching between sources. Audio input assignment - The audio input may be associated with one or more video inputs. Supports multiple embedded audio formats - IN1804 models are compatible with a broad range of multi‑channel audio signals, providing reliable operation with HDMI sources. Output Standby Mode - IN1804 models can be set to automatically mute video and sync output to the display device when no active input signal is detected. This allows the projector or flat-panel display to automatically enter into standby mode to save energy and enhance lamp or panel life. Power Save Mode - IN1804 models can be placed in a low power standby state to conserve energy when not in use. Front panel security lockout - This feature locks out all front panel functions; all functions however, are available through Ethernet, USB, or RS‑232 control. Contact closure remote control with tally output - Contact closure ports enable remote video input selection control, while tally outputs provide +5 VDC to illuminate LEDs for video input identification. The contact and tally ports may be configured for independent use when the IN1804 is connected to an external control processor. Compatible with Teamwork® Show Me® Cables - Show Me cables provide convenient connectivity and user input selection and control for TeamWork Collaboration Systems. Visit the TeamWork System Builder to create a customized system for your collaboration environment. Compact 1U, half rack width metal enclosure - The half rack width enclosure is designed for inconspicuous under table placement using the UTS Series Under Table Shelf System or MBU 123 Low Profile Mount Kit, available separately.